Discussions related to engineering and its applications. From civil and mechanical to aeronautic and robotics, etc. 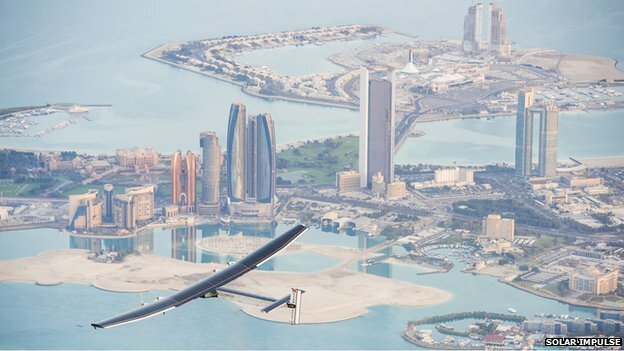 Solar Impulse 2 takes off today from Abu Dhabi on its attempt to fly around the world on solar power alone. The plane will fly day and night, but will make periodic rest stops every few days. Here's a shortcut to their technical challenges page, which gives a little bit of info on the Engineering. > On the plus side, their use of the latest PV and battery tech gives them both enough generation reserve and storage reserve to fly continuously for several days at a time, non-stop, both day and night. On other words, in full sunlight, their solar array is actually able to generate more power than their engines use for flight, with enough left over at the end of the day to let them fly all night (although I'm guessing at a lower 'max conserve' speed). > On the flip side, that surplus is not quite enough to enable them to fly continuously around the world, non-stop. Then again, the limits of the human body wouldnt allow that either, so that's hardly a deal breaker. It's still VERY impressive that they can fly 24/7 for 4-5 days without landing. Looks like they successfully took off, starting the first of a series of legs that will total a 2+ month journey around the world. Now Solar Impulse 2 leaves Myanmar for China. Last I heard, things may get interesting when they complete the current leg to the Chinese coast, when they'll have a big decision facing them: do they (a) fully charge up for the 5 day endurance flight to Hawaii (and risking a 1 week weather delay as adverse weather rolls in), or do they (b) bite the bullet and try to beat the weather and attempt the 5 day leg without a full recharge. I havent been following their progress closely enough to hazzard a guess either way. Looks like they're a little behind schedule, and the weather moved in faster than expected, so the china-hawaii stage will likely be delayed for up to a week, which will allow them to rest up, replace a malfunctioning solar cell, and fully recharge. That's solves the quandry they were facing. Looks like Solar Impulse 2 had to abort their attempt to fly from Eastern China to Hawaii in a single hop ... bad weather forced them to divert to Japan, where they appear to be waiting for an optimal weather pattern.